Excellent for long hair. Clean well and smells good. Good shampoo for long hair. I have really long and thick hair so this shampoo works well for me. I bought it when I was looking for something to keep my hair strong even with the length. This product worked great for me. It really helps strengthen your hair and keep it from breaking. It also helps your ends look healthy and strong. My hair responded really well to it. I would highly recommend this to anyone with long hair looking to strengthen it. It will help it look healthy and strong. Effectiveness This shampoo was incredibly effective in my hair. It lived up to what it promised that it would do. It made my hair look really long and helped it be healthy. It definitely felt stronger and I had less damage while I was using it. I think the performance is great and it lives up to its name. Scent The scent is great. It is even better when you pair it with the conditioner. I get compliments frequently when I use it. It is great! My hair is really damaged and I've used a lot of chemicals and colors in my hair, so the texture of my hair is damaged. My hair is very brittle and coarse so I have to take really good care of my hair. I used this Garnier Fructis length and strength shampoo and it was so amazing. It made my hair a lot stronger and my hair didn't feel as brittle as it did before. My hair felt a lot healthier and looked shinier too. My hair didn't feel as damaged, it felt softer and smoother. My hair grows fast so knowing my ends almost felt the same as the new growth means my hair is in better condition. I love the scent of this shampoo it smells like citrus fruits and it lasts in my hair all day. This shampoo is very gentle to my color meaning it didn't strip out my color or make my color run in the shower. The texture of this shampoo is really thick and it lathers very well deep cleaning my hair from root to tip without it being too heavy. I like how it didn't leave me with that greasy feel and how it was just lightweight to my hair. I would recommend this shampoo to anybody who wants there strength back. It makes hair less damaged and brittle. I tried Garnier Fructis Long and Strong Shampoo and Conditioner when my sister passed on the bottles after one use. She said she didn't like the way it made her hair feel and gave it to me to try. I have tried a lot of shampoos/conditioners and this has to be one of the worst. I know it has gotten some good reviews so maybe it's just my families hair that it doesn't work on. We have straight thinner hair. But we all use different types ranging from Dove, Pantene, to Pureology and love our shampoos. Garnier Fructis Long and Strong did not give me a good cleanse and left my hair with a waxy buildup. It also felt greasy. 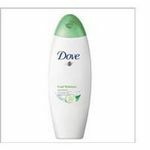 It lathered up well and the scent was good but just did not do a good job cleaning and left my hair in worse shape then before I shampooed. I gave it a second try (I did not want full bottle to go to waste) and I felt my hair was just getting drier and more waxy. I ended up throwing the bottles out. I would not recommend this shampoo to my friends or family. I have previously purchased and tried this Garnier Fructis Long and Strong Shampoo and I thought it was pretty good. First of all it did clean my hair really good without leaving it feeling weighed down. So that was really nice. Another good thing about this is that it left my long hair feeling very healthy and I guess you could say strong because it didnt break off like normal. I can say that it needed a little more moisturizer but it still left my hair soft and not so tangly and that is important when you have long hair. Another good thing about this Garnier Fructis Long and Strong Shampoo is that it has a really nice scent to it. I personally only like shampoos with a pleasant not overpower smell. The scent is nice and not over powering. Also the shampoo will last you a while because you do not have to use much of it when washing your hair, just a little bit lathers up really good. The price of this shampoo is very reasonable just as most all of the Garnier products are. It is very much worth a try. 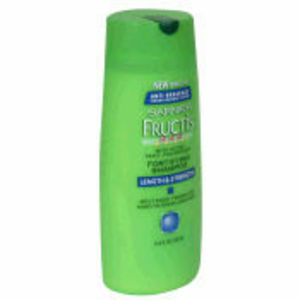 Garnier Fructis is one of the best shampoos available, and it is also really affordable. One of the products tat I like and don't have a problem finding these products at grocery stores and larger pharmacies is the Garnier Fructis Long & Strong Shampoo. This shampoo works great to keep my hair healthy and shiny, while also keeping it clean. When I use this, I don't have to worry about my hair becoming oily or too dry throughout the day. Since I have color-treated hair, I like that this is gentle enough for daily use. It keeps my hair split end free, while also keeping the color vibrant. It does not fade the color at all. Effectiveness This keeps my hair clean, but even better, it keeps my hair healthy. It really moisturizes my hair so I don't have to worry about split ends. It also doesn't fade the color of my hair at all. Scent This shampoo smells really good, and it keeps my hair smelling nice all day long. I like that the scent is sort of fruity, which is perfect for the summer months. It gets hair clean and makes hair smell really nice. It has a subtle refreshing citrus fragrance that lingers for a long time. It's probably an okay shampoo for people who have a little damage to their hair. I washed my hair with it, there is no way on earth I could have possibly combed my hair without conditioning it a lot first. I could feel my hair tangling while I was washing it. Effectiveness My hair breaks off all the time. When I brush my hair it fills up the brushwith pieces of my hair. When i stated using Garnier Fructis I immediatly saw a difference.But, again I had to use conditioner. Now, I was going to buy some of the expensive salon brands but, I'm glad I picked this up from the store.I have noticed that my hair has started to grow some in the past few months which is wonderful being that it breaks and falls out. Scent I love the citrus scent to this product. I wonder if they could make more options to other scented shampoo I would try that as well. I used this shampoo for a few years but my hairdresser convinced me to upgrade. It smells great, and it has a thick, creamy texture. But it isn't very good for my hair. It leaves it dry, and does not really repair damage like the commercial makes one think. I like the bright green packaging, it isn't too girly, but it's easy to pour out too much, and difficult to get out the last few globs of shampoo. Once you pop off the entire plastic top, it won't ever pop back on correctly. Also water gathers in the cap if you leave it in the shower. And this bottle doesn't always stay standing. Many times it has fallen into the tub and made a terrible clammer. I only bought this product when I was too broke to afford better, but it was better than other products in my price range. I like that it uses a few natural ingredients. But it's also got a few ingredients known for stripping hair of their natural oils. Best shampoo for long hair I have found! I have really long hair and am always trying shampoos targeted towards that. Of the brands I can buy in store, this is the best I have found. I felt like this shampoo really helped strengthen my hair, even at such a long length. It did a good job in helping my ends stay strong as well. If you are looking for a shampoo for long hair within a budget, I think this one is the way to go. 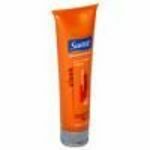 Effectiveness It was great on my long hair and really helped my ends. My hair is really straight so it's noticeable when my ends split. This shampoo helped my hair be strong and not split as much. I think it lives up to the name it promotes. 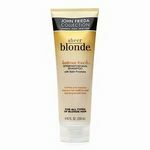 I pair it with the long and strong conditioner and that helps give you even better results. Scent I really like the scent of all the Garnier Shampoos. I think it is a strong enough scent to stay with your hair throughout the day but not overpowering. It is a good balance of smelling really good but not being too strong. I highly recommend this product. I like Garnier Fructis in general. Now as for the length and strength part of the shampoo I don't know if that part actually makes my hair any lengthier or strengthier. But I do know that it makes my hair super shiny and soft. Garnier also seems to tame the frizz and flyaways, even in the summer months when it is more humid outside. It also smells great too. I like that unlike some other shampoos on the market, Garnier never leaves my hair feeling like is has so nasty residue left in it. Like when all the soap doesn't come out. Effectiveness Fairly effective shampoo. It leaves my hair soft and silky with less frizz and fly-aways than other leading shampoos. Garnier also helps my hair feel clean and not residue filled after I get out of the shower. Scent I love the way Garnier smells! It's definantly a yummy, fruity smell. It isn't overpowering however it can still be smelled throughout the day. Sunsilk Captivating Curls De Frizz Shampoo 12 oz.